Ba í Rebecca McCarthy-Kent,23, as an Trá Mhór i bPort Láirge a thug léi Bonn Óir Seán Ó Riada ag an gcomórtas in Óstán an Rochestown Park i gCorcaigh Dé hAoine 1 Feabhra. Bhí 17 ceoltóir san iomaíocht sa chraobh. Tá Rebecca cáilithe mar mhúinteoir bunscoile, agus faoi láthair tá sí ag tabhairt faoi chéim mháistreachta sa cheol traidisiúnta in Ollscoil Luimnigh. Casann sí ceol traidisiúnta agus ceol clasaiceach, agus tá duaiseanna go leor buaite aici, ina measc craobh na hÉireann san fhidil agus sa phíanó ag Fleadh Cheoil na hÉireann. Tá níos mó ná 70 duine ag freastal ar a cuid ranganna ceoil i gComhaltas Ceoltóirí Éireann sa Trá Mhór, agus tá sí i bhfeighil freisin ar na grúpaí ceoil faoi 12, faoi 15 agus faoi 18 ansin. 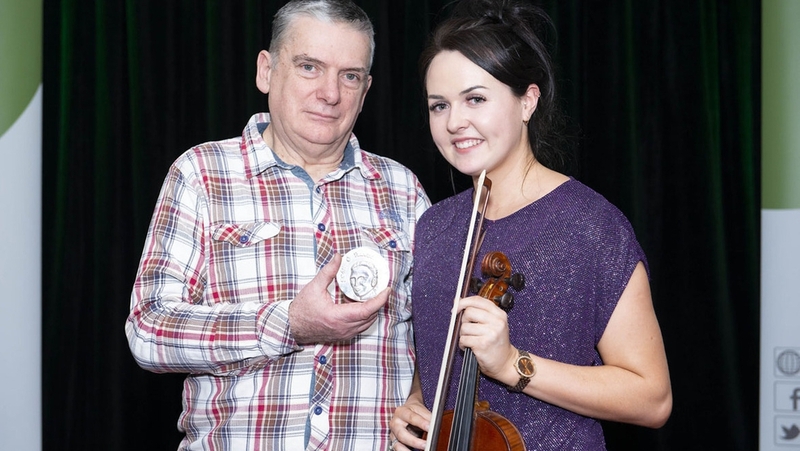 Is cumadóir í Rebecca freisin, agus cumann sí ceol traidisiúnta, agus ceol ar meascán idir ceol traidisiúnta agus ceol clasaiceach é.
Waterford musician Rebecca McCarthy-Kent took home the Seán Ó Riada Gold Medal and a cheque for €2500 at the final in the Rochestown Park Hotel in Cork on Friday 1 February. There were seventeen in total in the final, which was focused on fiddle this year. "I was in absolute shock that I won and couldn’t believe it for ages, but I’m over the moon. It’s a particular honour to have won a medal named after Seán Ó Riada."